Simple items which will make all the difference around the home, whether in the kitchen, bathroom or bedroom. Rehability stocks a wide range of helpful products that make carrying out ordinary everyday tasks easier and our staff will help you find the right item to meet your particular need. If we don´t have it in stock, we can usually get for you. 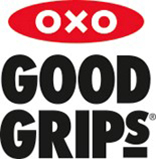 Household names and brands that you know include OXO Good Grips and StayPut by Isagi. Kit to help you with your personal hygiene and care, dressing, eating and cooking. 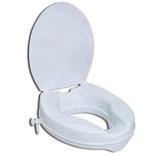 Raising the height of your toilet seat will assist with rising to standing. For people of shorter stature, a toilet frame or grab rail may the answer. We have a range of aids to assist with toileting including freestanding commode chairs. 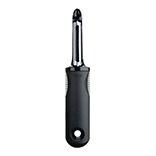 A classic for firmer vegetables, the Swivel Peeler's sharp, hardened stainless steel blade removes those inedible outer layers with ease and leaves all the good stuff underneath intact. 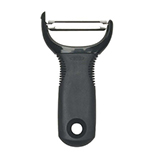 The soft, non-slip, cushioned handle won't slip, even when your hands are wet. Features a built-in potato eye remover. Dishwasher safe. A top quality, cushioned and comfortable slip resistant mat made to a generous size. Free draining with a lightly textured soft surface, and strong grip suckers underneath, which ensures a safe footing, helping to prevent foot and surface slip. Isagi antimicrobial bath mat are suitable for machine washing at 40 degree min wash and allowed to dry naturally. There is even an integral hook on the back, this bath mat is in a class of its own. Note: The shower mat is not considered suitable for showers with an uneven non slip surface, or where the surface has raised contours, as the suckers may not be able to fully adhere to the surface and that could cause the mat to slip and cause injury. Manufactured by the Helping Hand co - Aids to Dailiy Living Division. 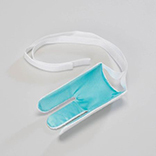 One of our best sellers - a flexible aid to make putting on socks easier when you can´t bend down to your feet. 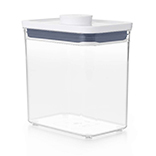 A modular storage solution full of possibility - perfect for storing brown sugar or rice with airtight seals, one-handed opening. Different sizes are designed to fit different pantry staples like flour, pasta, and sugar, and opening the Container is as easy as pushing a button. The button even pops up to serve as a handle for the lid! Manufactured by The Helping Hand Co . The Isagi StayPut stylish anti-slip trays are designed to keep glasses, cutlery and plates in place during the journey from kitchen to table and when used as a lap tray. The modern design has a distinctive high grip surface crafted with anti-slip studs that are moulded through the base of the tray giving an anti-slip underside to the tray. 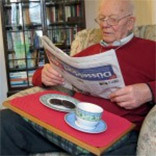 Isagi Non-slip placemats and matting prevent items from slipping and sliding. The material is soft, non-stick and easy to care for. Stay-Put mats come in a wide range of attractive colours to co-ordinate with colour schemes and in different mat sizes or in rolls to you to cut up. A full range of Isagi Stay-Put non-slip products are available from Rehability in Halesworth. This new and innovative kettle tipper is designed to be compatible with most kettles, including standard, jug and cordless Reducing effort required, for added safety the kettle will rock back into an upright position. The kettle is secured in place by two sturdy straps, and the tipper has rubber feet to prevent sliding. 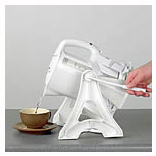 This feeding cup is designed with an angled spout to facilitate ease of use, also preventing spills if the cup is tipped over. 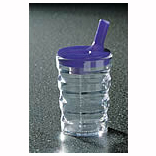 It can be supplied with a small aperture for drinking and a large aperture for semi-solids. Grooves in the cup sides ensure a better grip. A choice of colours is also available. They are also microwave and dishwasher proof. 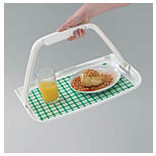 This tray is well balanced and the large carrying handle can be folded down for easy storage. We recommend a piece of non-slip mat on the tray, which will prevent items sliding around. 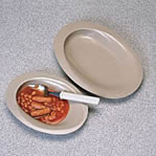 These melamine plates are designed to help those with one good hand or who have difficulty picking up food with utensils. They are oval in shape with a sloping bottom and high sided end to help scoop up food without spilling it over the sides. Dishwasher safe. 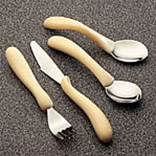 The Caring Cutlery range is a set of stainless steel utensils moulded into contoured, ivory coloured plastic handles with built up ends. These are of value to those with a weak grip and restricted wrist or finger movement.